At Thailand's infamous Tiger Temple, 40 tiger cubs were found dead, brutally stuffed into a freezer. 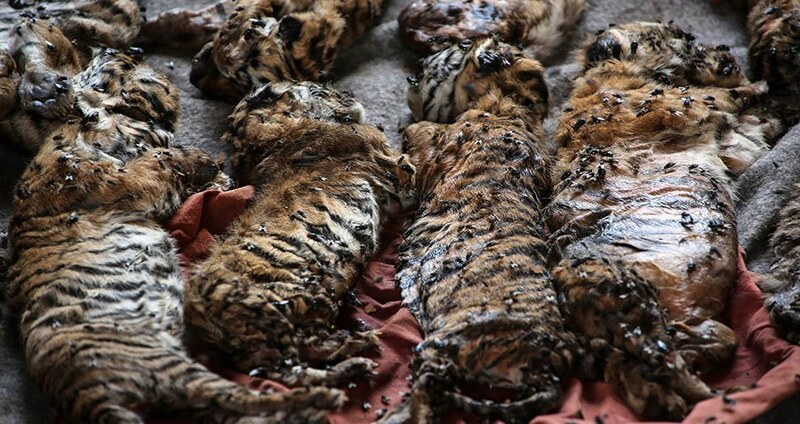 Authorities raiding a Buddhist temple made a grisly discovery on Wednesday: 40 dead tiger cubs stuffed into a freezer. Thailand’s Wildlife Conservation Office began raiding the Tiger Temple on Monday in response to allegations of animal abuse and trafficking. 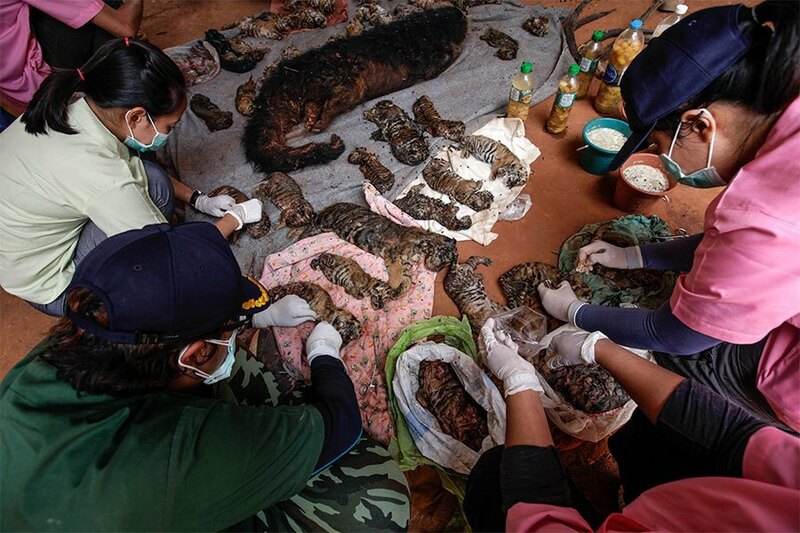 The dead tiger cubs were found in the course of authorities’ efforts to rescue the temple’s more than 137 surviving adult tigers, which the Wildlife Conservation Office says were mistreated in various ways. Tiger Temple, otherwise known as Wat Pha Luang Ta Bua, has been run by Buddhist monks since 1999. The monks give visitors tours of the facility, and for a price guests are allowed to bathe, feed, and pose for pictures with the animals. Since 2001, the Tiger Temple has faced scrutiny over allegations of animal abuse and unlawful breeding. Along with the tiger cubs, Thailand’s Wildlife Friends Foundation reported that the authorities also found a dead bear and binturong. Thai authorities say the temple’s proprietors bred the animals for profit, and then illegally sold them. Tiger body parts are especially valuable on the black market, where they are used among the wealthy in Chinese medicine. Representatives from the Tiger Temple deny any breeding program, and maintain that the tigers mate naturally. They also claim that the cubs were kept in the freezer to prove that they weren’t being sold on the black market. A Facebook post from the Tiger Temple originally written in March but reposted on June 1, claimed that the cubs naturally have a high mortality rate, and that their deaths are a regular, but unfortunate, occurrence. Despite such claims, the monks who run the temple may have violated international regulations protecting endangered species like these tigers, of which there are only 3,890 left in the wild. So far, 64 tigers have been removed from the temple, but authorities hope to rescue the rest of the facility’s 137. Tigers removed from the compound will be transported to government sanctuaries. As for the Tiger Temple? Apparently, there are plans to turn it into a zoo — plans that the temple’s management hopes, despite this week’s revelations, may still come to fruition. Next, find out more about why tiger populations are thankfully now on the rise. Then, see how one zoo in Thailand got pigs and tigers to rear each other’s young.